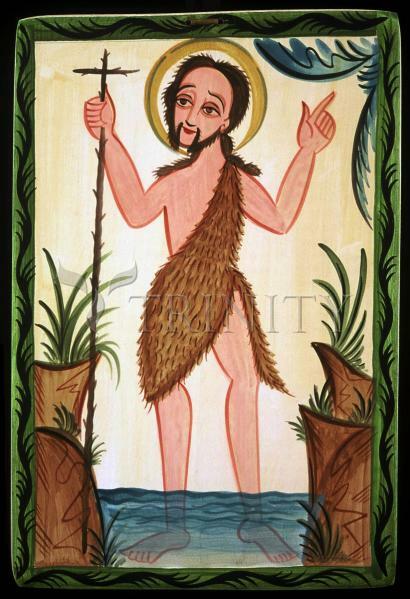 John the Baptist was the son of Zachary, a priest of the Temple in Jerusalem, and Elizabeth, a kinswoman of Mary who visited her. He was probably born at Ain-Karim southwest of Jerusalem after the Angel Gabriel had told Zachary that his wife would bear a child even though she was an old woman. He lived as a hermit in the desert of Judea until about A.D. 27. When he was thirty, he began to preach on the banks of the Jordan against the evils of the times and called men to penance and baptism "for the Kingdom of Heaven is close at hand". He attracted large crowds, and when Christ came to him, John recognized Him as the Messiah and baptized Him, saying, "It is I who need baptism from You". When Christ left to preach in Galilee, John continued preaching in the Jordan valley. Fearful of his great power with the people, Herod Antipas, Tetrarch of Perea and Galilee, had him arrested and imprisoned at Machaerus Fortress on the Dead Sea when John denounced his adulterous and incestuous marriage with Herodias, wife of his half- brother Philip. John was beheaded at the request of Salome, daughter of Herodias, who asked for his head at the instigation of her mother. John inspired many of his followers to follow Christ when he designated Him "the Lamb of God," among them Andrew and John, who came to know Christ through John's preaching. John is presented in the New Testament as the last of the Old Testament prophets and the precursor of the Messiah. His feast day is June 24th and the feast for his beheading is August 29th.